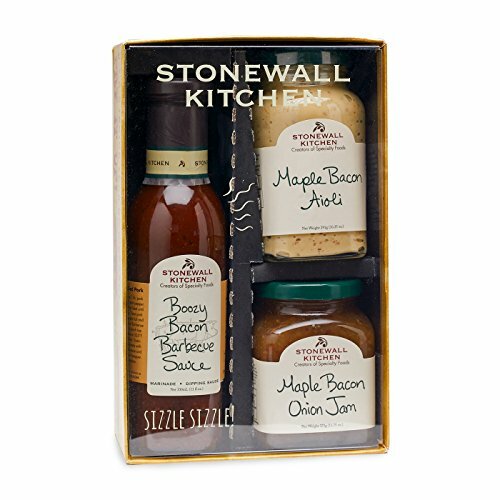 The delicious, savory flavor of bacon and its immediately identifiable aroma was the inspiration behind this mouthwatering collection. Our Boozy Bacon Barbecue Sauce is thick, rich and zesty with bits of real bacon, onion, spices and a dash or two of smooth bourbon. Our Maple Bacon Aioli is for anyone who craves the captivating taste of real bacon and sweet maple syrup. Finally, our Maple Bacon Onion Jam is an amazing combination of spices, sweet brown sugar, apples, shallots and once again, bits of real bacon.